The organization consistently shirks the pursuit of personal accolades in favor of team goals. How would a lack of hardware affect the perception of another stellar season? With this season’s MVP race hitting a fever pitch, it’s weird to think that the actual announcement is still 10 long weeks away. In case you’d forgotten, the NBA’s end-of-season awards will be announced all on the same day for the first time, via a completely-necessary, televised red-carpet event at the end of June. And regardless of whether guys like Pop (doubtful) and Kawhi (eh, maybe?) make the event, it’s possible the Spurs would play little part in the festivities anyway. San Antonio is a 60-plus-win team that, despite bidding farewell to its franchise bedrock, stands as the most realistic obstacle to a Warriors conga line to the 2017 championship. Yet, the league’s awards for individual player, coach and front office may fail to recognize how or why this happened. Despite palpable support for Kawhi Leonard’s MVP case (including some savory words from Matt Bonner), many conversations still seem to teeter between Westbrook and James Harden. Few if any expect Leonard to three-peat as Defensive Player of the Year; Gregg Popovich has done a superlative job balancing the loss of Tim Duncan with his greatest roster turnover, but names like Mike D’Antoni and Erik Spoelstra are getting louder consideration for Coach of the Year; their bench is too deep (and Pau Gasol has started too many games) for any one player to stand out enough to earn Sixth Man of the Year consideration, and it’ll be hard for the front office to get many votes in a year where Golden State added a two-time MVP to its star-studded core. Add to it all that Leonard is the team’s only All-Star (and the only player who’ll make an All-NBA or All-Defensive Team) and you have a sort of vacuum of recognition — a silence that hints at the gestalt-like greatness of this Spurs machine. “There are plenty of great analysts breaking down this race, but For The Win decided to ask the people who best know these candidates: their teammates. We requested phone interviews with role players from the Cavaliers, Rockets, Spurs and Thunder, leaving it up to the teams to decide who would best represent their star teammate. • The Cavaliers chose James Jones, James’ longest-serving teammate, who was with him for two MVP wins with the Heat. • The Rockets chose Ariza, arguably Harden’s best teammate and one of his most frequent assist-finishers. San Antonio is known for circling the wagons and keeping its players as detached from media narratives as possible, so the fact that they abstained from one article isn’t exactly a surprise. But it does speak to the advantages other candidates have in awards races. Everyone looks at awards differently. Their subjective nature, for all its flaws, stirs debate and asks us to constantly revisit history, and their winners help us contextualize what happened on any given year. Even its critics understand the weight they lend to athletes’ legacies. Teams appreciate this, and many are known for championing their players in all kinds of ways as ballot time approaches. In the least, it’s an opportunity for them to flex a bit of marketing muscle in the name of their stars; at best, they can help influence the final voting turnouts. Then there’s what’s at work systemically. Houston has constructed an offensive monster entirely around its star player. Oklahoma City has taken that idea a step further, not only putting the ball in Westbrook’s hands as many times as he can handle but (maybe) helping make sure rebounds come his way, too. The Cavaliers franchise has defined itself by LeBron James, even for the years that he wasn’t there. 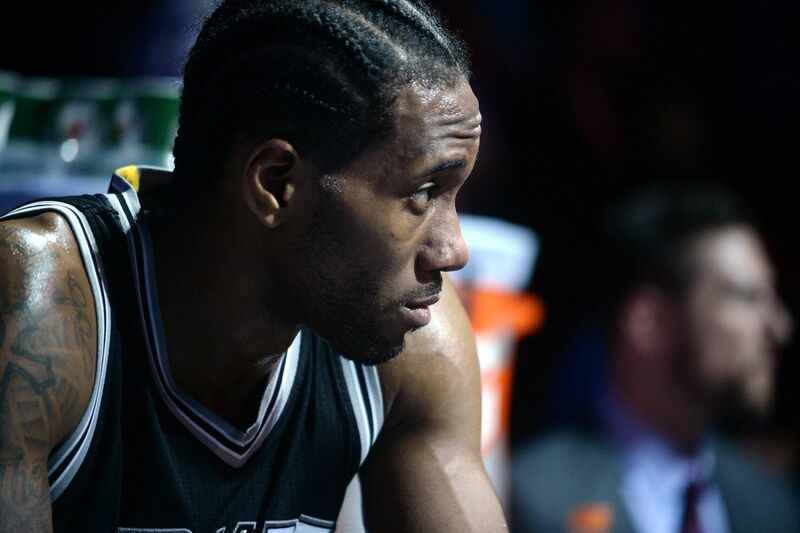 Individual accolades have rarely been consistent with the Spurs’ evergreen organizational success. Through five titles and a 0.705 win ratio over two decades, the team has only had two MVPs. Tony Parker has less All-Star appearances than Joe Johnson. Manu Ginobili has only been an All-Star twice and Sixth Man of the Year once. Tim Duncan, second all-time in Defensive Win Shares, never won a Defensive Player of the Year trophy. It’s probably indicative that Pop’s three Coach of the Year awards outnumber Duncan’s MVPs. The Spurs coach’s identity, more than any other, has permeated the team’s culture and, alongside R.C. Buford, provided the perfect blueprint for winning. Pop won’t likely be in an uproar if he or Kawhi or anyone else gets passed over on June 29th. But it will show that, no matter what happens in the playoffs, the Spurs have collectively (and, as always, quietly) put together another remarkable year.